SINGAPORE - The largest children's garden in Asia is now situated right here in Singapore. 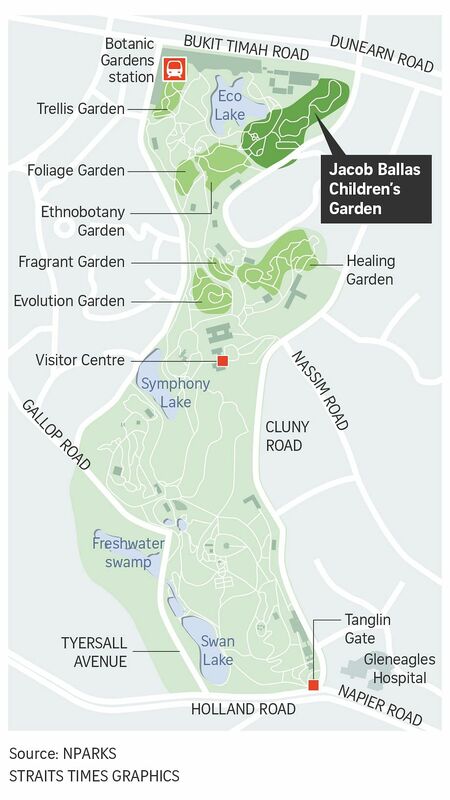 Following a 2ha extension, the Jacob Ballas Children's Garden at the Singapore Botanic Gardens has doubled in size to 4ha, making it the largest of its type in the region, the National Parks Board (NParks) said in a press release on Friday (Nov 10). While it formerly catered only to children up to 12 years old, the extension now caters for youngsters up to 14 years old. It has attractions and programmes to help children learn about a range of eco-systems. Funding was partially supported by a $1.9 million donation from the Jacob Ballas Estate and Friends, and other fund-raisers. This year marks the 10th anniversary of the garden. The inaugural Singapore Botanic Gardens Children's Festival will be organised by NParks from Nov 11 to Nov 26, to celebrate the extension's opening. Children can experience the new attractions, and families can enjoy a series of performances, along with food and games. Minister for National Development and Second Minister for Finance Lawrence Wong officially opened the extension and launched the Children's festival on Friday morning.